Foreigners numbered one of every two visitors to museums and related activities in Iceland in the year 2014. Nearly nine of every ten foreigners who visit museums while staying in the country attend historic museums and natural history museums and exhibitions, or 86 per cent. The number of museums which provide information of origin of their guests has increased steadily since in 1996. The total number of foreign visitors to museums and exhibitions, which were able to provide data on composition of their visitors by origin for 2014 was about one million compared with 826 thousands Icelandic visitors. Figure 1 shows the share of foreign guests to the museums over the period 1996-2014. Visits to museums differ greatly by origin of their guests and the topic of the museums. Three of every four foreign museum visitors in 2014 visited historic museums and one fifth natural history museums. At same time only three and one per cent attended art museums and aquariums and zoos, respectively. In 2014, about six of every ten Icelandic museums visitors attended historic museums; two of every ten aquariums and zoos and 15 per cent to art museums. 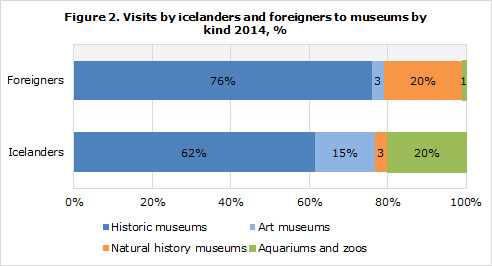 Only three per cent of Icelandic museum guests visited natural history museums and exhibitions (see figure 2). Visits by origin of guests differ greatly by subject of the museums. Most guests of aquariums and zoos were Icelanders, or 96 per cent. Most of the guests to art museums are Icelanders or eight of every ten, while the majority of visitors to natural history museums and exhibitions were foreigners, or about nine of every ten. 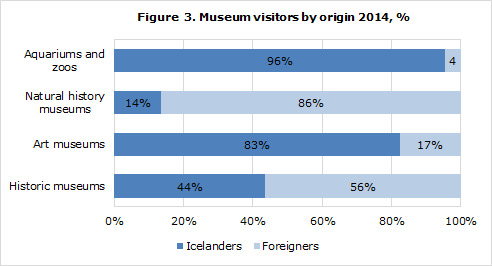 Visits to historic museums divided 56 and 44 per cent between foreigners and Icelanders, respectively (see figure 3). 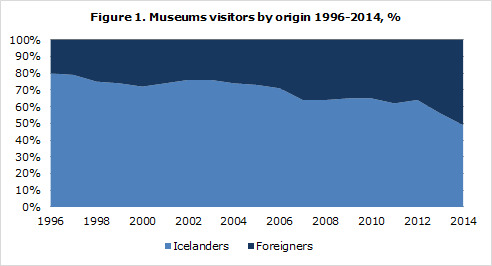 The number of museums able to provide information about the number of visitors by origin has increased steadily since 1996 when Statistics Iceland began to collect this information. For the year 2014, 86 per cent of the museums were able to provide the data compared with 42 per cent for the year 1996. The information from the museums is in most cases estimates, based either upon surveys and counting from guest books. The figures include museums and special branches of museums, science centres and permanent exhibitions open for public display, which were able to provide the number of visitors.